Giving a birthday birthstone rosary to someone that has deep faith in the Catholic religion is giving a gift with great significance and meaning. 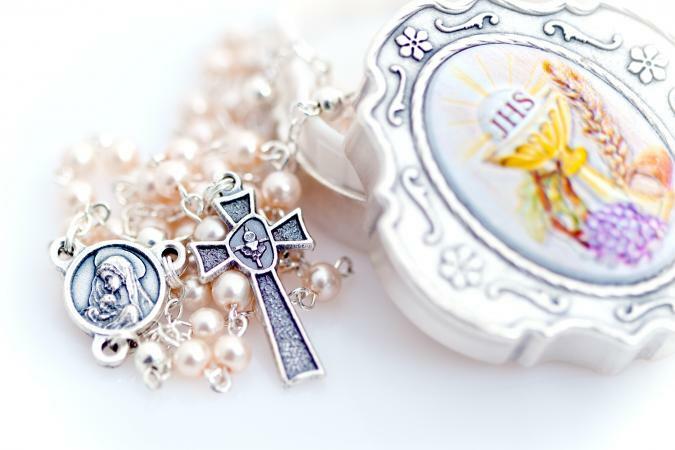 The rosary plays a very significant role in the Catholic faith. The word itself means rose garden in Latin and it represents both the prayers of devotion that are said in honor the Virgin Mary, and the actual prayer beads themselves. When a person prays the rosary, it is a time to remember and reflect on important events in human salvation and to praise and thank God for them. Each rosary bead stands for a particular prayer which is said in order. At the beginning of the rosary is a Crucifix followed by one large bead, three smaller ones and another large bead. Next is a centerpiece with a holy depiction which joins the rest of the beads in a circle. The beads are set in five groups of ten and are separated from one another by a single bead. For more information on the prayers of the rosary visit The Prayers of the Holy Rosary. A rosary made of your birthday birthstone is a special set of prayer beads with special meaning for you. Each stone, whether it is glass or crystal, is representative of your birthstone. Many of the birthstone rosaries are made with silver or gold toned metals linking the beautiful crystals together. Although the colors of the birthstones used in rosaries may differ in shades slightly from company to company, the basic colors are the following. Birthstone rosaries are available at many online jewelry stores. They are offered in many different styles with prices ranging from approximately $10 to $40 for glass beads and up to several hundred dollars for Swarovski crystals. The following are several of the many excellent websites offering these devotional prayer beads. Birthstone rosaries make wonderful and thoughtful gifts for birthdays, First Holy Communions, Confirmations or any special occasion. Each birthday birthstone rosary has special religious meaning and makes a thoughtful gift for the recipient.